Wine	December 20, 2016 No Comments. Thank you Spain for inventing Sangria. And thank you United States for making it a national holiday. Which is today by the way. Hoping you and yours have a happy and safe Sangria Day. A Long History Made Short: Back in the day, water wasn’t safe to drink. So everyone drank wine because the alcohol killed the germs. Even toddlers got in on the action. But drinking the same old thing everyday got boring, so those smarties in Spain started adding other stuff to their wine, like fruit and spices. Then they decided to wow us Americans with the stuff at the 1964 World’s Fair in New York. Everyone loved it and we still do today. The end. Make Your Own: There are two types of Sangria: Traditional (made with red wine) and Sangria Blanco (made with white wine). Since it’s the holiday season, here’s a classic, 5-star, red recipe, dubbed “Sangria! Sangria!” from All Recipes to enjoy with your loved ones. Or totally by yourself. No judgement. In a large pitcher or bowl, mix together the brandy, lemon juice, lemonade concentrate, orange juice, red wine, triple sec and sugar. Flat slices of lemon, orange, lime and maraschino cherries in the mixture. Refrigerate overnight for the best flavor. For a fizzy sangria, add club soda just before serving. 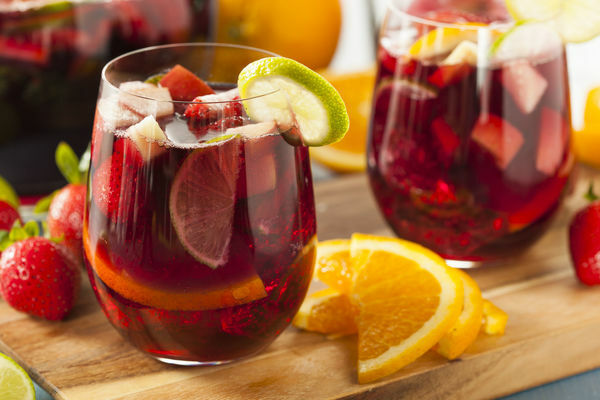 12 Days of Drinks: It’s National Sangria Day.